The New York Dock Company was a rail-marine, offline contract terminal identical in operation to that of Bush Terminal, being that New York Dock and Bush Terminal had carfloating operations, carload and less than carload contract terminals, direct bulk offloading of ships to railcar, and would have large storage warehouses at their disposal whereas the Brooklyn Eastern District Terminal did not have direct ship to rail or large warehouses. Carfloats with railroad freight cars would come from the various railroads on the mainland in NJ and the Bronx, and bring in commodities to three different pier terminals located south of the Brooklyn Bridge. In north to south order. Fulton, Baltic & Atlantic. It also owned warehouses in Red Hook, that did not have rail access. The New York Dock Company was the successor to the Brooklyn Wharf and Warehouse Company. On July 17, 1901, the company acquired the Brooklyn Wharf and Warehouse property from under foreclosure and took possession of those properties on August 1, 1901. Following the bankruptcy of Bush Terminal in 1971. 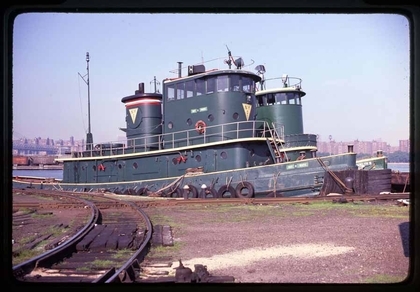 The City of New York purchased the land that Bush Terminal sat upon and leased the railroad operations at Bush Terminal to New York Dock in 1972. As with almost every railroad, following the acceptance and widespread use of long distance trucking, almost every railroad in the Northeastern United States began to suffer financially. In July 1975, the United States Railway Association released its "Final System Plan" which in accordance with the Regional Rail Act of 1973. Made recommendations for the reorganization of the railroads in the Northeast United States. Subsequently, the Interstate Commerce Commission recommended that New York Dock and Brooklyn Eastern District Terminal operations be merged to avoid duplication of effort. It wasn't until 1978, that Dock Properties. The parent company of the New York Dock Railway. Acquired the Brooklyn Eastern District Terminal. Negotiations started in September 1977. However, it was not until early 1978, that New York Dock took actual possession. In August of 1983, the company ceased operation.